The Verano line is one of the automotive manufacturer’s new luxury sedans that began production in 2011. Since then, the original model has received an update only once. The standard model features a 2.4 liter engine with a total output of 180 HP and could run on gasoline, E85 ethanol or a mix of the two. In late 2012 a 2.0 liter turbo version was added to the lineup as well as a 6-speed manual transmission. The 2.0 liter engine was capable of an output of 250 horsepower. From the outside, the car featured a wide and tall front bumper with rectangular headlights and a rather large front grill. The rear featured a large bumper and rear lights that were extended towards the sides of the car. As a standard option all Verano models had 18 inch wheels and sound absorbing mats. The model was mainly targeting the Chinese market but it became popular in other regions of the globe. 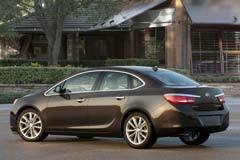 2016 Buick Verano 2016 BUICK VERANO SPORT!! LOW MILES, LIKE NEW!! GREAT PRICE! !